Djungarian hamsters are quite popular Pets. These tiny rodents are perfect for families with children, as different and playful disposition. Care for them is quite simple. Unlike other animals, such as dogs or cats, they do not require a large space and they do not deliver a lot of trouble. These cuties are very clean and bad odor. Like other animals, hamsters are prone to diseases. Their health should be given special attention and, if necessary, should promptly seek assistance from the experts. 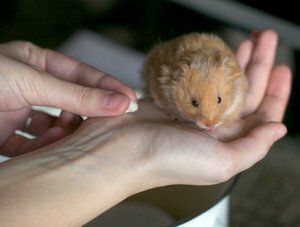 The owners of Djungarian hamsters need to be aware of the illnesses that can overcome these small animals. It is very important to recognize the disease and to help your little friend. Disease in these small rodents are different. They can be both minor and very dangerous to the rodent, and its owner. Various kinds of injuries. Mostly bruises, sprains and fractures. Due to the fact that these Pets are very fragile, the owner, unwittingly, may cause mechanical injury to the beloved animal. Viruses and various bacterial diseases. The reason can be not only hypothermia, but also beriberi. It is also worth to watch closely, that the miniature animal was in the draft. Diseases of the eye. There is the likelihood of conjunctivitis in hamsters. This disease can be caused by allergies, injuries, and respiratory infections. Diseases of teeth and oral cavity. From Djungarian hamsters may be different kinds of abnormalities as well as inflammation of the cheek pouch. Excessive growth of teeth may also be a serious problem for animal health. Disorder of the gastrointestinal tract. From Djungarian hamsters may occur, and infectious disease. They are dangerous not only for the health of your pet, but also for the people who come into contact with him. Rabies. This disease can occur from the bite of an infected predator. It happens quite rarely. Lymphocytic choriomeningitis. This disease is dangerous because in humans it usually occurs without any symptoms. Helminthiasis. For a person can be dangerous only one species of worms — dwarf tapeworm. In order to avoid these diseases, need to buy Djungarian from reliable breeders who have good references. It is also very important to observe hygiene and not to neglect the rules of care for the animals. the protrusion and opacity of the eyes, and clouding. If any of the above symptoms you should immediately contact your veterinarian. Quite often Djungarian happen dental problems. 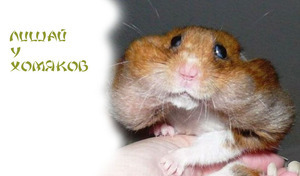 Due to the excessive growth of teeth hamsters may refuse food and thus lose weight. To avoid these problems is to provide your pet with items that will help him whittle down his teeth. Not uncommon are considered and pathology cheek bags from Djungarian hamsters. neoplasm (the tumor should be removed by surgery). Conjunctivitis is a very common ailment that occurs in Djungarian hamsters. This disease may occur because of various factors. In this disease the eyes of Djungarian inflamed, you may experience photophobia and swelling of eyelids. If time does not deal with the treatment of this disease, inflamed and the cornea of the eye. Cataract eyes can also occur in Djungarian hamsters. In this disease the animals may partially or completely lose vision. Clouding of the lens can be seen on the pupil in the form of whitish spots. This disease can be caused by various injuries, and it can also be congenital. Diseases of the limbs also refers to common illnesses of hamsters. On the paws Djungarian hamsters may appear abscesses. This disease can be beat small animals, if they are inactive or obese. Fractures and injuries of the legs is also quite common in hamsters. They can be provoked by careless treatment of the owners or drop miniature animals from the height. Hair loss from Djungarian hamsters has been observed for a variety of reasons. This can serve as stress and lack of nutrients. And also this ailment may occur as a result of fungal infections or diseases of the gastrointestinal tract. In order to prevent these diseases it is necessary to give a fortified and balanced diet to your pet. If the animal was struck by ringworm, it is necessary to undergo specialized treatment. Djungarian can also occur dermatitis. They manifest themselves in the form of itching and various rashes. The presence of lice and fleas also adversely affects fur and skin of Pets. While itching and form tangles. Overheating and stress provoke hyperthermia in Djungarian hamsters. Most often this disease is observed in animals weakness and heart palpitation. 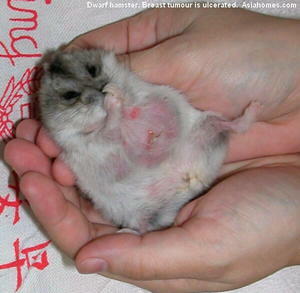 In hamsters, there is the likelihood of tumors. They can be both benign and malignant, they are removed mainly by surgery. During the pregnancy this ailment Pets, as a rule, refuse to eat, sneeze and become inactive. Colds hamsters need to raise immunity, for that in their diet, you need to add fruits and various vitamins. If you encounter this dangerous disease there is a strong depletion of the animal. Basically, if there is a disease of animals die. This is a very dangerous and complex diseasethat is accompanied by cough or shortness of breath, and diarrhea and no appetite. After death, it is desirable to destroy the carcasses of infected animals.